A tumour is any type of abnormal growth in the body. Benign tumours usually grow but do not invade the surrounding tissues and are not normally harmful unless they develop in specific locations in the body. Malignant tumours (sometimes referred to as cancers) invade the surrounding tissues as they grow and therefore can be dangerous and even fatal. There are many types of benign and malignant skin tumours. This information sheet discusses malignant tumours. Malignant skin tumours commonly occur in the eyelid. 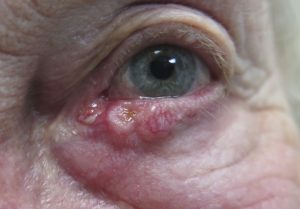 The most common types of malignant eyelid skin tumours in Caucasians are basal cell carcinoma (BCC) and squamous cell carcinoma (SCC), but other rarer types include sebaceous gland carcinoma and melanoma. These cancers can all grow and invade surrounding tissues, which can be very damaging to the eye and eye socket. Very occasionally, some of them can also spread around the body (metastasise), which can be fatal. BCCs hardly ever spread to other parts of the body, and only ever do so when very they are left to get very large. SCCs may spread if they are left too long before treatment. Sebaceous gland carcinomas and melanomas have a higher chance of spreading if they are not treated when they are small. Skin cancers should to be removed. This is normally done surgically (excised), although occasionally other treatments like radiotherapy and chemotherapy are also used. The whole tumour and a surrounding ring of healthy tissue (a margin) should be excised. The excised sample is sent to the pathology laboratory to be examined under a microscope to confirm exactly what type of tumour it is and if the whole tumour has been removed. You will be brought into the operating theatre and will lie down on a bed. You will have anaesthetic eye drops put in both eyes. These can sting for about 30 seconds. The tumour and planned margin of excision will be marked. You will then have local anaesthetic injections. If you are awake (not sedated or general anaesthetic), this will sting quite a lot, rather like a dentist’s injections. The tumour and surrounding area is thoroughly cleaned with an antiseptic. Sterile drapes are placed around the head and surgery will commence. Immediate reconstruction: the tumour is removed and the eyelid is reconstructed immediately afterwards during the same operation. Frozen section analysis of the specimen: the tumour is excised and is immediately sent for examination under a microscope by a pathologist before commencing the eyelid reconstruction. The pathologist will check the type of tumour and make a preliminary assessment of whether there is any tumour at the edges (margins), of the specimen. If the margins are clear, the surgery can proceed to reconstruction of the eyelid. If there is tumour in the margins, further excision may be necessary before reconstructing the eyelid. Delayed reconstruction: the tumour is excised and sent to the pathologist who makes a thorough assessment of the specimen over the next 1- 3 days. The eyelid is reconstructed in a separate operation after the pathologist has given a full report on the tumour and its margins. What are the reconstructive options once the tumour is removed? The main priority is to remove the entire tumour and a clear margin around it. It is also important to try and reconstruct the tumour excision site in such a way that the eyelids and the eye can still function normally and the cosmetic appearance is as close to normal as possible. The exact type of reconstruction depends on how much tissue/eyelid is removed. For smaller excisions, the excision site can usually be closed directly, i.e. by stretching or moving nearby tissues into the gap. A skin graft taken from elsewhere in the body. Common places that grafts can come from are another eyelid, in front or behind the ear and the shoulder. Occasionally other graft materials such as the ear cartilage, the roof of the mouth (hard palate) and abdominal fat are used. For large lower lid tumours a procedure may be used that stretches tissue across from the upper lid of the same side. If this procedure is used, the eye will remain closed for 1-4 weeks and then a small second procedure is done to open the eyelids. Some larger reconstructions may require several operations. Eyepad: if you do have an eyepad, your surgeon or nurses will tell you when you can remove it. Swelling and bruising: this may be reduced by applying a small ice pack to the area for 20 minutes at a time, followed by a 20-minute period without the ice pack, three to four times a day for a few days after the surgery. This swelling will settle steadily after the operation but can take some weeks after bigger operations. Pain: this can usually be managed with paracetamol (Panadol®) or ibuprofen (Neurofen®). For more severe pain your surgeon may prescribe stronger pain relief medication. Eye cream: your surgeon may give you some antibiotic cream to use after the operation although not all operations require this. Stitches (sutures): your surgeon or nurses will make a follow up appointment at which the skin sutures are likely to be removed. Sutures under the skin are left to dissolve. Scarring: your surgeon will aim to place all cuts in locations that are hidden by your natural skin creases and folds and to suture them in such a way as to minimise scarring, but you may be left with some scar lines. Most patients do not have any significant problems or complications after surgery, but there are some things to look out for. If any of the following occur, you could contact the Eye Department. You will have a follow-up appointment 1-2 weeks after the surgery. Further follow-up will depend on the type of tumour, the risk of recurrence and if any further treatment (e.g. chemotherapy, radiotherapy or additional surgery) is required. Some patients with less aggressive cancers will be discharged soon after the surgery, while others may be followed up for years after the surgery. There is a large amount of evidence supporting a multi-modal approach to patient care. For larger or more aggressive tumours, this means that not only will your surgeon be involved, but other specialists such as medical oncologists, radiation oncologists, radiologists and other may be involved. Your surgeon will make these initial referrals if it is needed in your case.